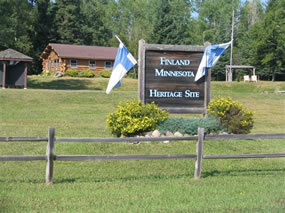 Welcome to Finland Minnesota Historical Society! On January 21st, 1986, 18 Finland Minnesota families convened the first annual meeting of the newly created Finland Minnesota Historical Society. Their founding goal was to preserve a 40 acre homestead that had been, after years of vacancy, acquired by Lake County as a condition of tax forfeit. Later that year, in December, Lake County officially deeded the 40 acre John Pine Homestead to the Society. Since that time a relatively modest group of volunteers has enabled both the vision and the Heritage Site to grow. 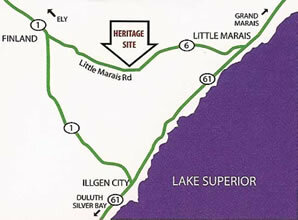 The Finland Minnesota Historical Society’s vision for the Heritage Site is to provide area residents and visitors, from near and far, with the opportunity to both celebrate and experience the settlement history of eastern Lake County, with special emphasis and focus on the region’s pioneer families. The vision is to be accomplished by adding a number of structures to the site, original when available or replicas when not, to enable the Heritage Site to conduct living history programs which will, as much as possible, reflect and celebrate the early pioneer life of eastern Lake County. The Heritage Site is open to the public from 11 a.m until 4 p.m. on Thursday until Monday of each week from mid May until mid October.